I have had a delightful time working with the young musicians who took part in my London masterclasses over the last two days. Thank you, Trio Fournier, Gagliano Ensemble, Trio Minori, Veronika Kopjova and Vashti Hunter! Chamber music is in safe hands if the hands are such as yours. We were lucky to be able to work in the beautiful home of Bob and Elisabeth Boas. 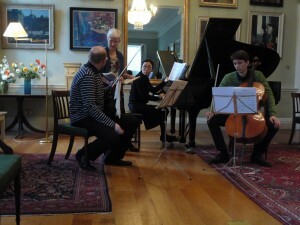 Here I am with the Trio Minori from Munich – Janis Olsson, Madoka Ueno and Joseph Steinkuehler. This entry was posted on Saturday 16th February 2013 at 11:47am	and is filed under Teaching. You can leave a response, or trackback from your own site.